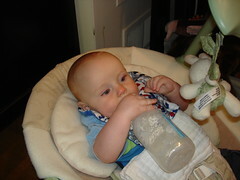 Now the sippy cup on the other hand is just a baby soaking device! So I am playing a game with myself, "Finish something old-ish, astart something new-ish." 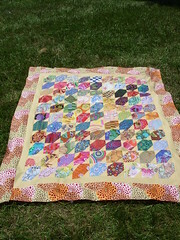 I finished a Kaffe charm quilt (Photo will be in a separate post shortly.) now I get to start an I SPY coin quilt. 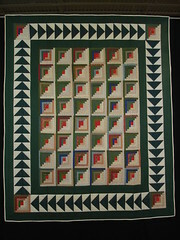 This is not technically "new" since I have been collecting images & trimming fabric for is for a long while. 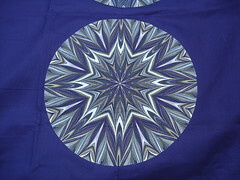 (It morphed from a different pattern.) 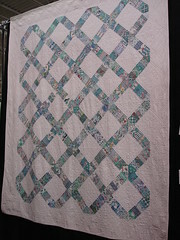 I did only "recently" decide to turn it into a coin quilt & I did only recenlt pare down the pile into 224 pieces. I Spy is my "series." My series will be interspersed with a lot of "gee that has been in my stash for quite some time" & "Gee I'm not 'feeling' Kaffe anymore, maybe I should do something with my Kaffe fabrics now..."
I am home with Jacob today & about to sew while he is napping. 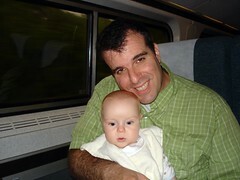 One of these guys had his first train ride, the other had his first Father's Day. I don't even recall what went on on Saturday it was sooooo long ago. 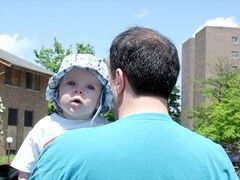 But Sunday was a day filled to the brim. About a month or two ago, my husbad said that he wanted to visit his mother in New York for Father's Day & that is exactly what we did. We leave on the 5:15 train headed to DC. The train was full, but a lot of people leave the train in New York, so we waited for a couple seats while Jacob was able to stay in the car seat/stroller. Jacob slept most of the way back on the train, he woke up in Maryland & we nursed. So the car ride home & betime routine were o.k. if a bit late! Was your father's day that busy? I just have to jot this down before I forget. (Like the thing that my husband said in the car - all I can remember is he guessed a singer songwriter was Eric Carle - so you know where our brains have been!) He meant to say Eric Clapton! 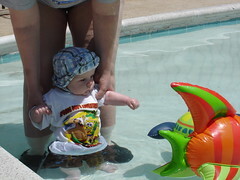 When Jacob is playing & almost suddenly stops & grunts - guess what is going on. 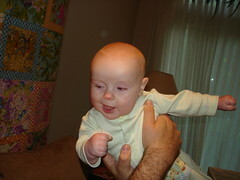 Oh & we are seeing the beginings of two teeth! "Hey, I was a kid of the 80's!" keds - or the knock-offs that I had. walkman - that is all that I wanted, I got a cr@ppy on that only played am radio & was shaped like a smurf. Pac-Man - I rearly played, but the images were everywhere. Aqua net hairspray - quite possibly by the case. The Breakfast Club - my all time favorite movie. A great way to use an odd assortment of 9-patches. 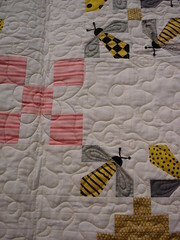 Love the bees, the log cabin border is made out of a honey comb shaped fabric. See all bees don't have to have striped bodies! It did not photograph well, but this was one of my favorites. 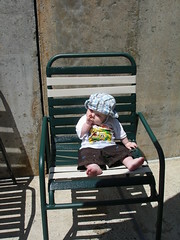 I want to do one of these for my son! That would have been hard to do back when feedsacks were readily available! Pull out your 70's & 80's calicos! I really like those blues! 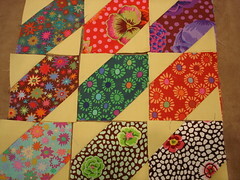 Does anyone have any of this fabric that they no longer want? :o) (I want to do an all blue log cabin for my son & this would be the perfect addition!) 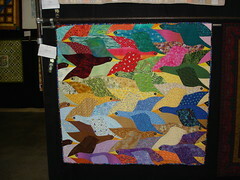 BTW I loved this quilt because it used this kind of fabric in a bird! Many many more photos on my flickr! 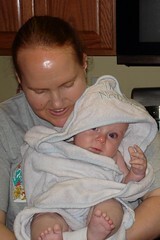 A summer cold me be the worst illness ever... & for mine, I can only thank my son. 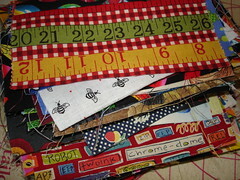 So I have not done any sewing for a good week! 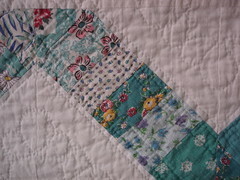 I would have sewed on my Kaffe quilt - just so I can be done with it & because it is just past half way done on the blocks in my sewing machine! 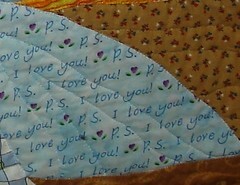 It is an old-ish quilt from my stash, which is a good thing & it sure will feel good to have it done. (I'm kind of making myself work on something old-er along with the newish stuff that I want to do.) 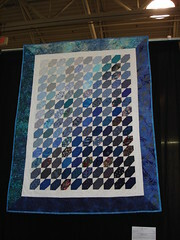 At any rate, I completely forgot to take a picture of the Kaffe Quilt. 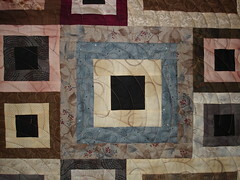 This was supposed to be my "What is on your design 'wall'" quilt. But Jacob had a bad couple days over the weekend & woke up with crusty eyes on Monday, so I took him to the doctor (cold & another ear infection) & we stayed home the rest of the day after running some errands. With that time my rows were sewn together into a top. 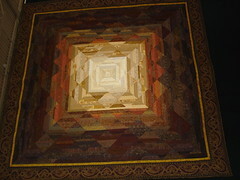 The quilt is a 9x11 arrangement with no black & whites repeating. The yellow is a Moda marble (I so wish I had found a Kona cotton instead.) & is the same throughout. 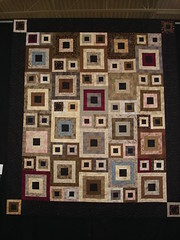 A couple people have mentioned how it looks like pist-it notes which is the scale of those squares! 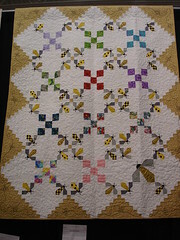 But I am calling this a NYC quilt, because the back has Taxis & NYC landmarks in addition to more of that yellow! It will be bound in yellow. 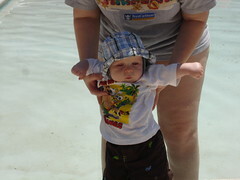 In addition to some family visitation & a brunch picnic, on June 7th, Jacob sat unsupported for the first time! 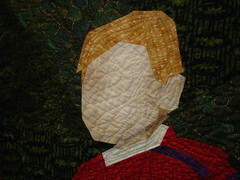 I am going to a quilt show tomorrow (Jacob is staying home with daddy) with a friend for her birthday. It is in Chantilly, Virginia at the Dulles Expo Center. It is a local show, but it rivals a national show & has always been worth going to see. 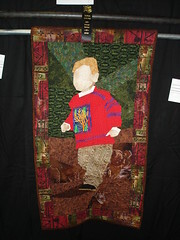 Quilters Unlimited of Northern Virginia. Well earlier this week I had a meeting where I was only there to answer "technical" questions. Which in essence means that I was there to listed ot a few hours worth of "jargon." (My work is scientific & requires peer review.) I did not have to pay attention, I just needed to be there in case there were any questions. 14. Amy Butler fabrics - what to do? 15. Tiddlywinks - what to do? 16. 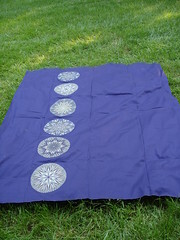 Spirograph flowers - what to do? 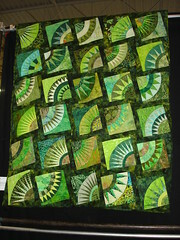 These were off the top of my head & in current thought there are a myraid of other quilts - 2 CW UFO's, pieced cat UFO's, etc. & If I were to actually go diving into my stash/stewdio many other items would percolate to the list(s). Off the top of your head what does your list look like? 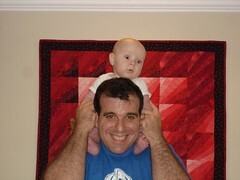 This is an older photo, but I wanted to show Linda at Quilts & Kids how we read daily. 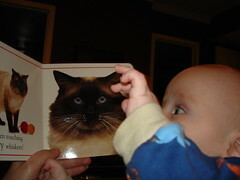 Jacob loves his books, especially the touch & feel variety. This page has "wiry whiskers." 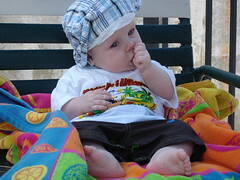 I'm sure the baby is thinking, "What did I do?" Sunday, the day that was. To be brutally honest, I got up & pumped at 2 a.m. I also fed the cats att his time, because if you are going to get up & out of bed, you are going to feed the cats. 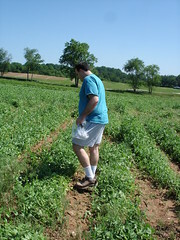 So after IHOP, we went home & readied ourselves for picking. 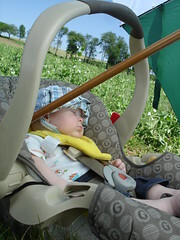 Jacob slept while his parents picked. 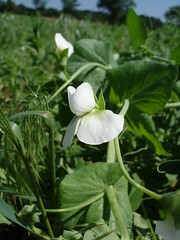 I picked a lovely pea flower to photograph. He likes to lie on his side & twist up in the blankets just like his mommy. Add in all of the other mundane stuff of life, you know why I wanted to sleep in again today & why I pack in so much on a vacation - my life is already packed full! These had been cut out & waiting for a very long time. (The I SPY's caught my attention in the middle of this project.) 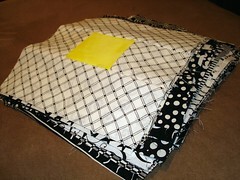 What you cat see in this pile are 95 different black & white prints with the same yellow centers. The blocks finish at 9 inches. This is my black & white challenge project. I have 4 more to piece so that this will be a 9 x 11 layout. 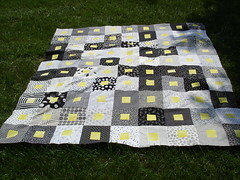 I was going to mix in 10 blocks with a black & white center & a yellow frame, but those will end up as back art instead. 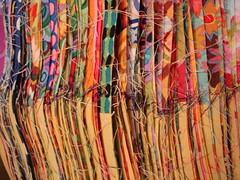 Along with NYC Taxi Cab fabric as that is what this color combination reminds me of. 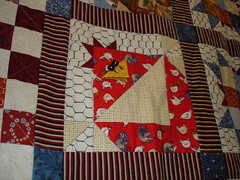 I also have a pretty NYC fabric that will also go on the back. Both of those will be big pieces so that the images will be complete. BTW a lot of this sewing took place in the wee early hours of the morning as I had to pump overnight & could not get back to sleep. The moral of that story is: It is a good thing that I have my sewing machine set up in the living room with 2 ready to sew projects handy.